Companies increased dividend payouts by a robust $17.8 billion in Q1 2014, compared to a $14.5 billion increase in Q1 of 2013, a 14.2% year-over-year increase, according to S&P Indices. Some 1,078 dividend hikes were reported in 2014's first quarter, dethroning the prior Q1 record of 1,069 set in 1979. Within the broad-based S&P 500 Index, 84.2% of the index's companies currently pay a dividend – the most since September 1998. And all 30 Dow Jones Industrial Average members pay a dividend. Payout ratios (dividends as a percentage of payout ratios), however, which historically average 52%, remain near their lows. Yet at the current declared dividend rate, companies could handily set a record payment for 2014, according to Howard Silverblattt, S&P Dow Jones Indices' senior analyst. 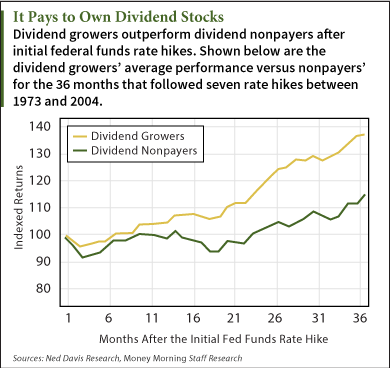 With so many dividend payers to choose from, investors should remember that not all dividends are created equal. And, that it's never prudent to simply chase yield. The top dividend stocks have a long history of paying dividends, a solid global presence, a stable business line – and plenty of cash. Top Dividend Stock No. 1: Duke Energy Corp. (NYSE: DUK) is an energy conglomerate operating in the United States and Latin America. Its three operational segments include regulated utilities, international energy, and commercial power. DUK is among top dividend stocks in the energy sector, with a quarterly dividend of $0.78 per share for a 4.27% yield. For all of 2013, the Charlotte, N.C.-headquartered company produced strong revenue and earnings per share (EPS) growth of 25% and 50% respectively. Recent analyst actions include a "Buy" initiation from CRT Capital and an upgrade to "Buy" from "Hold" at Deutsche Bank. The company has been paying uninterrupted dividends for 88 years. According to Thomson Reuters, six analysts rate shares a "Buy," one has an "Overweight" on the stock," one has an "Outperform," and one maintains a "Neutral." One quarter equals five Nichols.